Situated between Guatemala, Honduras and Nicaragua, El Salvador is the smallest country in Central America. However, after some bus tours in the mountains, you have the feeling that El Salvador is endless! On its small territory, you can find so different landscapes: long and regular beaches on the Pacific coast, dense rainforest, high mountains, volcanos… El Salvador capital city is named San Salvador, to makes things easy to remember, and it is also the only point of entry for foreign visitors arriving by plane. Is El Salvador worth visiting? Definitely yes, but you certainly won’t grasp the charm of El Salvador at a first glance. El Salvador is not (yet?) a resort like Cancun, catering to North-American tourists, with every inch marked with “please-accept-the-general-conditions-if-you-want-to-use-this-chair”. You feel you are in an authentic place instead! Meeting with Salvadorans will strengthen this feeling. 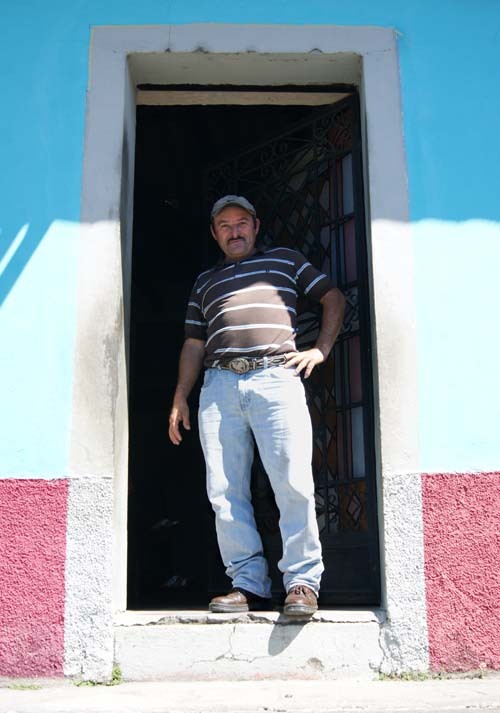 The Salvadorans are very friendly, welcoming and helpful towards foreigners. They are suspicious of strangers though, and they may feel frightened themselves. The first impression I had was that people in El Salvador are protective. I am mostly talking about the people you have just met, by chance, without having been introduced. They have this in common with Russians, because they also went out of a very difficult history. El Salvador underwent a bloody civil war that ended only a decade ago; You can still feel the scars of this time. 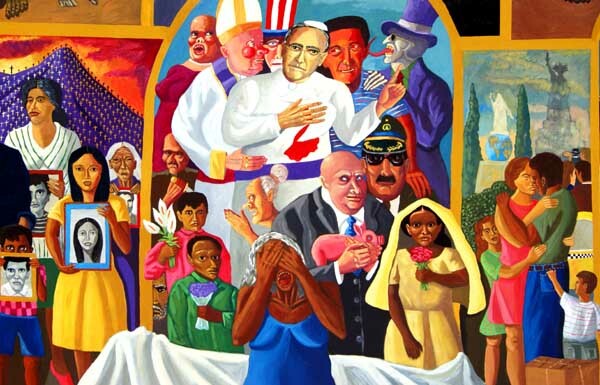 To explain shortly the background, the civil war lasted about 2 decades and took its roots in the 70’ in San Salvador in a climate of extreme poverty, unemployment and urban overpopulation. As in many other countries in the bipolar world, the left and right political parties struggled for power. A leftist, Duarte, of the Partido Democratico Cristiano, won the presidential elections in 1972, but was accused of fraud and was ousted. The power was taken by the Right forces. Leftist rebellion increased and the right party reacted by creating ‘death squads.’ Thousands of Salvadorans, including women and children, were kidnapped, tortured and murdered. From that time on, continuous struggles between right government and leftists groups went on. The civil unrest transformed itself into a real civil war in the 80′. It even gained an international aspect in 1981, when the USA, warned by the success of Nicaragua’s socialist revolution, decided to inject huge sums into the Salvadoran military (over US$500 million in 1985), thus, fueling the war. In 1981, the US-trained Atlacatl Battalion exterminated over 750 men, women and children in El Mozote, Morazán. As many as 300, 000 citizens fled the country. Some sad sporadic events I prefer not to describe here, worsened the situation. During this war, an estimated 75, 000 people were killed. Peace came only in 1992, when a ceasefire took effect. The government agreed to lead reforms, such as dismantling death squads, replacing them with a national civil police force, investigating human-rights violations. Thanks god, today El Salvador is a relatively quiet country. Just like I was, you might be frightened by the exuberance of armed guards in front of each shops, even smallish restaurants or grocery stores. During the night, nobody will let you out on your own in the street. Many young men loiter in the street. 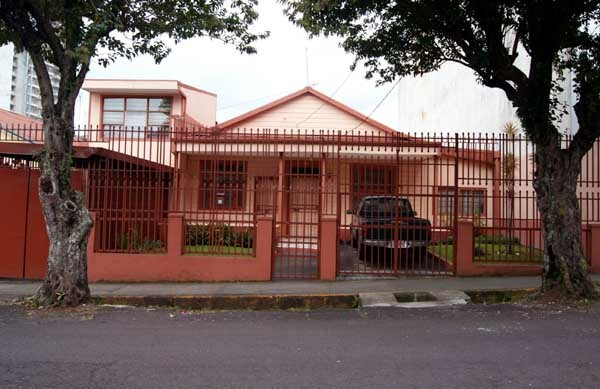 Houses have these typical railings around them, called “rejas” in Spanish. This atmosphere is actually felt only in San Salvador, so leave the city to feel more at your ease in El Salvador.You may hear in big Salvadoran cities about crime and gangs, but you can hear the same about Nicaragua or Honduras too. If you don’t come out from a cabaret at night-time with some valuables on you, you will be fine. As many people don’t see El Salvador as a very safe place, the country is not harmed by mass tourism. You will hardly see foreigners in some resorts at Acayutla. Most visitors are drivers coming from neighbour countries. This country has a true potential for development: Let’s hope that El Salvador will develop its tourist industry in a smart way. Have I already said you will feel like in an authentic place? And, oh! Did I mention that I went to El Salvador to attend the meeting and incentive travel show MITM Americas? Well! Thanks a lot to the organizing committee for letting us discover such an interesting country. The MITM program included many tours by bus. One of them brought us to Las Palmas, a charming and colorful Salvadoran “pueblo”. I went to the city on my own and even found the courage to ask people to pose for me! 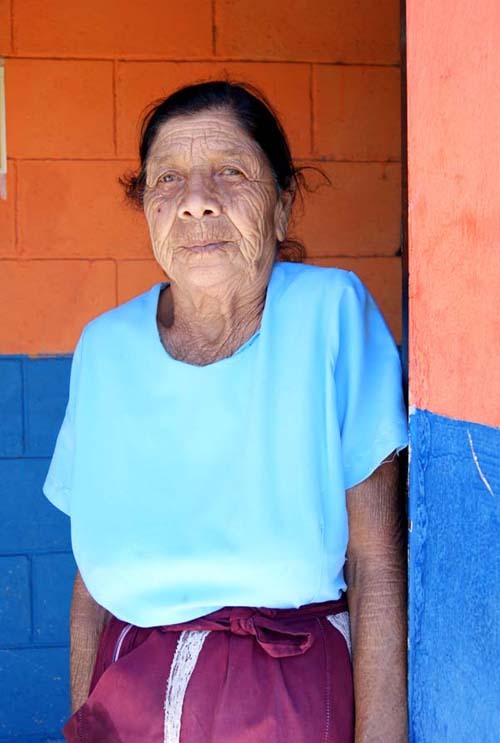 Not like in Peru or Costa Rica, Salvadorans were at first reluctant to be taken in photo. Country’s past and the few amount of tourists passing by Las Palmas may easily explain that. Not to mention that most typical tourists in Las Palmas come from the US, and don’t necessarily speak Spanish. I took the time to explain to people I come from Russia (Aah! The sympathy between socialist nostalgic people!). I also said that I strive to understand their culture by learning Spanish before my trip and that photo is my hobby. They let me take a few photos of them, but nor them, neither me, were at ease. I guess it takes more time or more shots of aguardente to tie friendly relationships! Places like Las Palmas abound in El Salvador. It takes a few days to explore its other landmarks. Dozens of well-preserved colonial cities such as Suchitoto, Santa Ana, or Panchimalco to name a few. El Salvador is situated on the famous Ring of Fire of the Pacific. There are hundreds of volcanos, geysers, hot springs, in El Salvador. The one you can see here is the volcano Izalco, at the Cerro Verde Volcano park. This view is seen from an old abandoned hotel, dominating the Izalco volcano. What happened there is a perfect illustration that you can not bet on a volcano to make profit: In the 90′, the volcano was continuously blowing lava for decades. An expensive investment project was initiated to build a hotel on the Cerro Verde mountain. Unfortunately, just when the hotel was inaugurated, an earthquake seriously damaged the hotel and the lava flow stopped till now. The site now looks like an old city lost in the jungle. 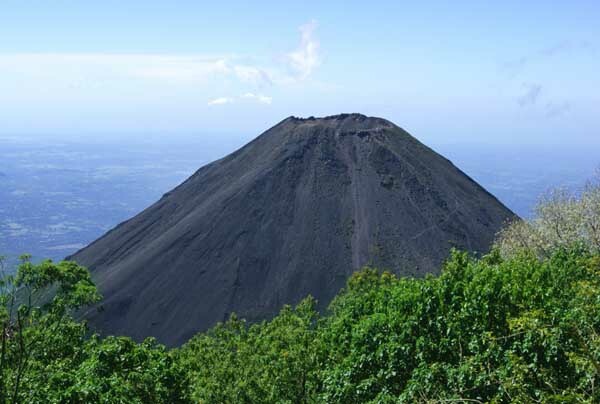 San Salvador itself is located on a volcano flank, named Santa Ana. In 2005, the volcano erupted. Fortunately, lava flows and landslides occurred on the opposite side from San Salvador, but many villages on that side were destroyed. Hundreds of people went homeless, crops were lost. 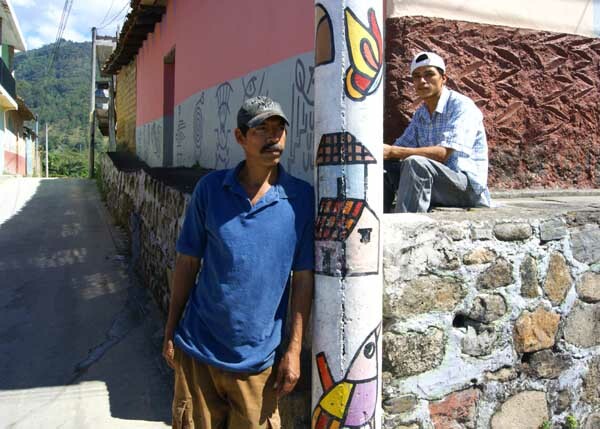 Nearly one million people live in San Salvador; the city could have become a second Pompei. 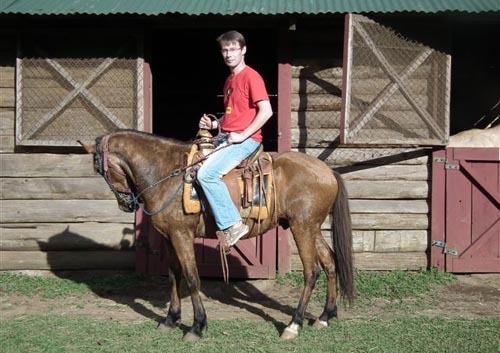 Finally, I actually had one of the most fascinating moment of my life in El Salvador, when, thanks to Kim Lawhorn, a horse trainer from Ashland, USA and the professional team of Portezuelo Park, we went for a ride in the coffee plantations. The tour took place in the mountains of El Salvador, among shade-grown coffee trees, with stunning views on misty valleys and sea in the background. El Salvador landscapes are truly wonderful. I highly recommend this place for people looking for adventure and high emotions. What an amazing feature. You are so gifted. Thank you for sharing! All the best to you and Maria in the year ahead. Look forward to seeing you again soon!